Finishing revision for the day is definitely one of the best feelings. After hours of learning I've walked into town, bought myself a drink and a flapjack and am just relaxing a bit. I think it's really important to get out and at least have a walk if I'm not up for a run (which I have seriously been slacking on recently) so I'm not cooped up all day every day. All this revising and not seeing my friends as much is making me a little more emotional than usual (thanks A Levels!) and so I thought it would be nice to share a word from the wise to try and stir some positive thinking. I haven't written one for a while so if you don't know the premise for these posts, you can find out more here. I thought I'd change things up a bit and not only share a few quotes that I'm loving at the moment but also some songs. Isn't it such an amazing feeling when you hear a song and the lyrics just completely resonate with how you feel or really move you? It's happened less and less recently but I have fallen head over heels in love with these next two songs. The lyrics of both are just stunning and I honestly can't stop listening to them. It's got to that stage where I'm listening to them over and over and I know that it's going to get to the point where I'm sick of them but for the life of me I can't make myself stop! Definitely two to add to the all-time favourites list, that's for sure. Last Friday I had my last day at secondary school. I can't tell you how surreal it feels to write that. I guess when you spend fourteen years in school year in, year out, it's a little weird to imagine not spending every day there. Unsurprisingly for me, Friday induced a lot of nostalgia for me, resulting in me reading back over this post I wrote two years ago, when I had my last day at the school I'd been at for five years, knowing I was moving school even though I didn't want to. 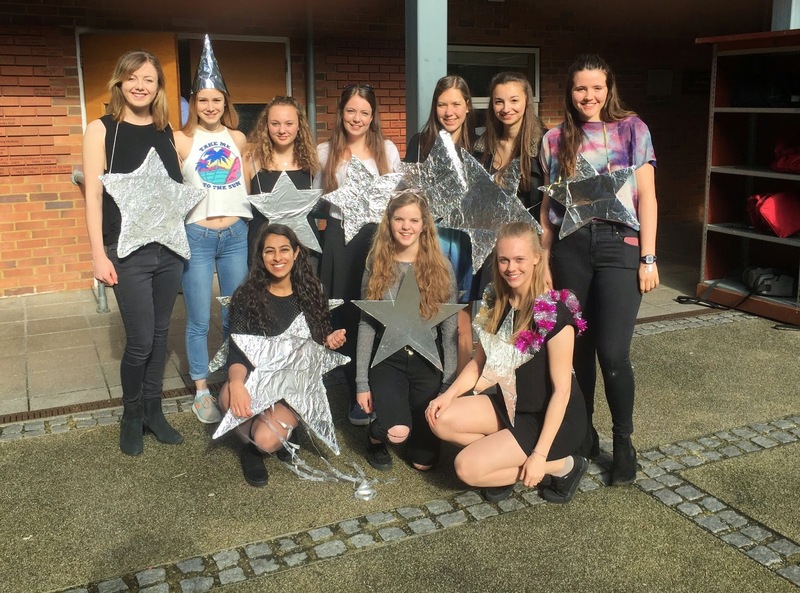 The theme for our muck up day was space, although a lot of the boys went dressed up as a beach theme, which was an interesting mixture to say the least! As you can see, my friends and I all went dressed as stars. It meant being really arty which let me tell you if right outside my comfort zone but I think we managed to pull it off. The morning was spent making ice cream in form (our form tutor is a physics teacher) which was *delicious*, playing articulate and eating food in double philosophy, followed by eating yet more food in politics and having a quiz. There's a clear theme of eating that I'm afraid to say continued throughout the day. Sadly, our teachers cancelled our leavers' assembly and reception as the muck up day pranks went a bit too far so in all honesty, without that, it doesn't really feel like I've finished school. While I'm on study leave now, it still hasn't properly hit me that that was my last day so it's a bit of a shame that the leavers' assembly was cancelled. We'll still have prom after exams though which is when I assume leaving will start to feel real. The rest of the day was spent with my friends, eating (again! ), having a few drinks in the pub and going out in the evening. 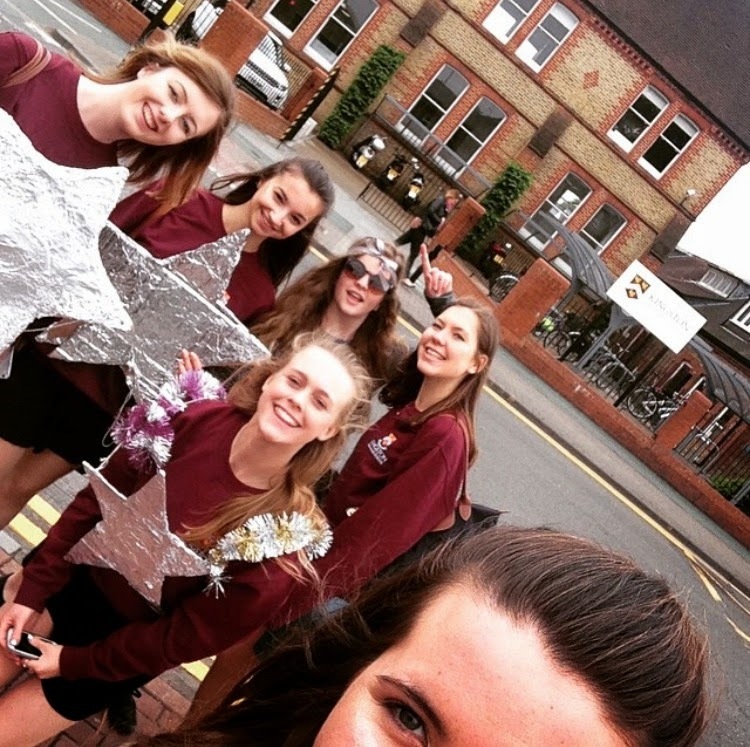 Despite the assembly being cancelled, it was a really lovely day and reminded me how lucky I am to have had two years at such a great school. So there we have it, the end of an era and all that. But here's to new beginnings and them turning out to be not as bad as you might initially think. Hello everyone! The past few weeks have been have been mad mad mad, as the ones before them were too... it's just a crazy time of year but thankfully all my mocks are over and in just over a month all my A Level exams will be over (let's pretend that's not true to ease my self-induced panic attack at the mention of that though!) so hopefully normal blogging will resume very soon. 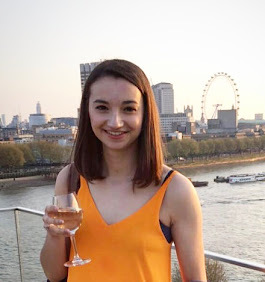 I just wanted to write about what a fabulous evening I had on Thursday night. 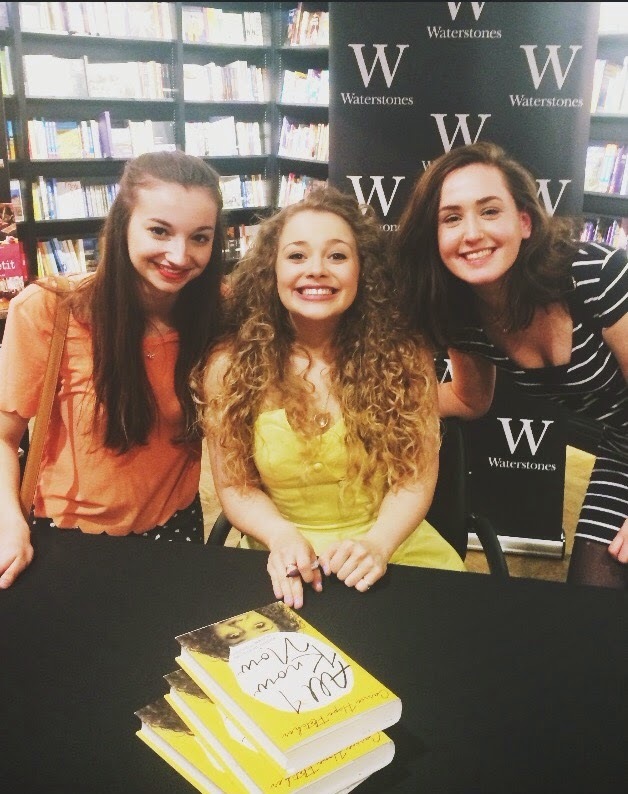 I'm sure I've written about her before, but I absolutely adore Carrie Hope Fletcher (check out her channel here if you haven't already!). I've been watching her videos for well over a year now and am always left so in awe of how lovely and incredible she is. This is a lady who balances performing in a west end show eight times a week, making youtube videos for her 500,000 subscribers, most of which are young teenage girls, that often leave me inspired to change the way I think, and on top of it all, she's written a book, All I Know Now. It's safe to say that she's one of the most inspiring people I've come across and so, Rosie and I, being the fangirls that we are, snapped up tickets as soon as they were released for her book tour. It's safe to say we had a wonderful time. I met Rosie in Picadilly and we headed off for a drink at Cafe Nero before going for dinner at Pizza Express. It was so lovely to catch up with Ro and talk about anything and everything that's been going on over the past month or so since we last saw each other. I know I've probably said it before but I'll say it again, it's so amazing to have friendships like this, where no matter how long you go without seeing each other, when you see them again it's like you've never been apart and you'll laugh until your tummies hurt in each other's company. This is something that really makes my heart happy I have to say. Anyway, after dinner and with Rosie barely being able to contain her excitement (not that I was much better) we found our way to Waterstone's for the event and went down to the lower ground floor where it was being held. Loads of people were already there and we went to pick up copies of All I Know Now for ourselves before waiting for Carrie to arrive. There were even beautiful All I Know Now cakes just for the event. As soon as she arrived the room burst into applause and everyone seemed to be in awe that Carrie was really in the room, myself included. She was visibly nervous as she sat down and in the first few minutes which just made her even more likable (if that's even possible!) as she really is the most genuine person you'll meet. Benjamin Cook started by asking Carrie some questions and she then read out an extract from the book which was both a hilarious story and yet had such a powerful message; which really sums up Carrie, from the impression I have of her. This followed questions from the audience and a performance of two songs which Carrie asked us to sing along to. After this we all went over and queued to meet Carrie and have our books signed. I was honestly quite nervous at this point as it's always a bit of an odd experience to meet someone famous/who has a following like this who you kind of feel like you know because of how open they are but at the same time you don't actually know! Speaking of which, I really loved that Carrie spoke about how open a lot of people consider to be as she's shared so much of her life, but at the same time, she made it clear that there really is a line and things that she will hold back. It seems that her outlook is, if me sharing this is going to help someone, then why wouldn't I do it? And I think I really relate to that. Especially in this little space of mine. Of course I won't tell you everything, but I think it's good to share. Not necessarily on the internet if that's not your thing but definitely with someone or in some way. Carrie pointed out how important it is to be honest instead of keeping things in, and that's something I wholeheartedly believe in. Anyway, sorry for the little unexpected tangent then... where was I? Ah yes, the moments before I met Carrie. I needn't have worried because, although Rosie and I only had about a minute with her, she was so lovely and friendly and we had a little conversation while she signed our books and took a photo with us. And then it was over. And Rosie and I got on the tube before heading our separate ways to get home, both of us thinking about what a wonderful evening it had been. I'll share some photos from the night below but before I do, I'd just like to urge you all, whoever you are, whatever age you are, to pick up Carrie's book because, although I haven't read it all yet myself, from what I've seen of Carrie and from excerpts I've heard from the book, it's really going to teach me so much - here's a video of her reading the first chapter if you're interested. Thank you Carrie for such a wonderful evening and for being courageous enough to share your stories and experiences so that others can learn from them and know they're not alone; to me that's such an honourable thing.